Journalling is one of my favourite learning tools on my personal Tarot journey. I love nothing more than to fill up pages with my thoughts, ideas and mental connections. I lay a deck out in front of me and make a colourful mess of cards, taking myself on a wonderful exploration into the world I have loved and learned from for so long. The best thing about this kind of brainstorming and creative expression is that I don't often use my ideas to produce anything which I intend to share or use in another project. I simply enjoy externalising my internal perceptions so that they become stronger and more certain. It helps me to strengthen my bond with each card, troubleshoot any rigidity or resistance I'm experiencing and, most importantly, ensure that my reading practice improves so that my clients can continue to benefit from my readings. I have often been told by others that they tend to get stuck or stale in their journalling practice despite their best intentions to keep it going strong. Sometimes it's difficult to know where to begin! There are so many different ways to enjoy a productive journalling practice. Methods include daily or weekly draws, Tarot art (collage, painting etcetera), brainstorming individual cards, studying card combinations and recording the results and impressions of readings you did for yourself or others. There are many other possibilities too. My view is that it's best to work out what lights you up when you think about keeping a journal. Do you imagine getting lost in the creation of character traits for each card? Do you want to keep a kind of Tarot-related diary of your life, using the cards to represent your issues and triumphs? Maybe you don't want it to be word-heavy - perhaps just a few key words or relevant quotations for each card would be perfect. Don't pressure yourself to fit into a certain style or formula. Instead, decide what kind of journalling practice aligns itself with your personality, and remember that there's no law against trying your hand at a little of everything! I am personally moving on from a (now completed) word-heavy journal to a much more visual, picture-heavy journal in which I experiment with expressing my ideas through collage and painting. But I also have two pocket journals - one for key words and random inspirations and the other for inspiring thoughts about what it means to be a Tarot reader. So, if you're always looking for an excuse to splash out on stationery, consider this to be your official permission slip! If you struggle to think of different perspectives and focus areas for your journalling practice, I'm hoping that these prompts will enable you to get creative and stay inspired. For those of you who prefer using art in your journals, many of these ideas can be adapted to your needs so, instead of picking up your pen, get your art materials ready! 1. Which card always 'lights you up' when you see it and why? 2. Which cards could represent anger and conflict? State your reasons. 3. Draw a card at random: What kind of messages could it offer about romantic relationships? 4. Separate the Minor Arcana cards into number groups and Court types. Look through each group. Which groups do you feel more drawn to? Which groups present more difficulty for you? 5. Tell your life story in Tarot cards. 6. Tell the story of a loved one in Tarot cards. 7. Explore the cards which come to mind when you think of the words 'unrealistic expectations'. 8. Write down your favourite colour, city, food, time of year etcetera. 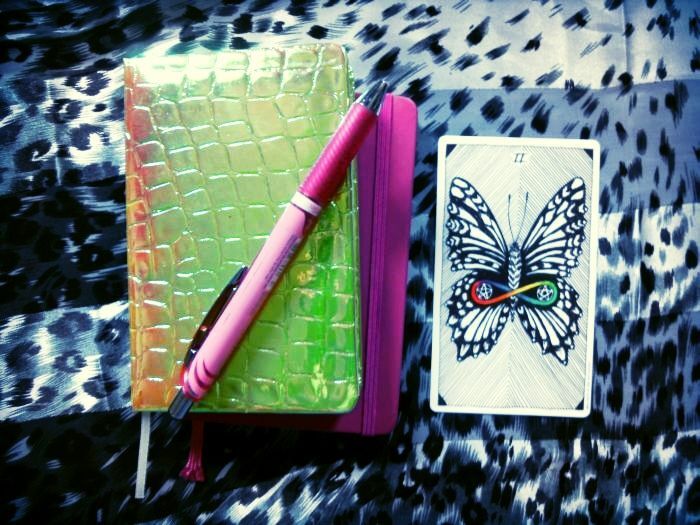 Once you've written down all your favourite things, choose Tarot cards to represent them. 9. Imagine that a querent is having difficulty expressing her emotions in a relationship. She fears being vulnerable, but bottling her feelings up is jeopardising the connection. Design a spread to help her. 10. Which cards come to mind when you think of the words 'feminine power'? 11. Explore the cards which best describe the things in your life that you're grateful for. 12. Draw a card at random: What kind of messages could it offer about family dynamics? 14. How does Tarot help querents to understand and deal with their fears? 15. Explore the cards which best describe your current life goals. 16. Describe your personality using Tarot cards. 17. Divide the cards into two groups: 'Ego' and 'Spirit'. Then write about your emotional response to this exercise, what you discovered, the issues you had etcetera. 18. Explore the cards which come to mind when you think of the words 'divine wisdom'. 19. Play a game of opposites. Draw some random cards and then decide which cards represent their exact opposites. Write about your perceptions and decisions. 20. How does Tarot help querents to release what they need to let go of and receive what they want to obtain? 21. What are the most challenging Tarot experiences you've had so far and what you've learned? 22. Explore the cards which come to mind when you think about the word 'fear'. 23. Choose three cards which you don't feel as closely connected to. Commit to writing about them regularly for at least a week. 24. How does Tarot help querents to design the life that they desire? 25. Think about a favourite book or movie. Choose Tarot cards to represent the characters and write about your reasons. 26. How have you changed as a person since you first picked up a deck of cards? Which changes have occurred in your inner and outer life since that time? How has Tarot helped you to ride the tides? 27. Which Tarot figures you would seek advice from in troubled times? 28. Imagine that you need to create a pantheon of gods and goddesses. Ten is the maximum number that is permitted. Choose the Tarot figures which make up your pantheon. Give reasons and also consider which ones you would adopt as a matron and patron. 29. Explore the cards which come to mind when you think of the words 'imagination versus reality'. 30. Design a spread which helps querents to overcome their creative blocks, complete projects and think of great ideas. 31. Write about the weak points in your Tarot practice and list some proactive steps which will help you to improve your skills. 32. Write a letter to the Tarot figure of your choice. 33. Explore the cards which come to mind when you think of the word 'transformation'. 34. Look for some quotes which seem to define how you feel about life. Use Tarot cards to describe the message of each quote and state your reasons. 35. Design a spread which helps querents to overcome anxiety and rejoin the outer world. 36. Write about the likely negative effects of giving a Tarot reading to someone who is not yet ready to make positive changes or have their opinions challenged. 37. Make a list of your Tarot ethics and beliefs about the tool and its uses. 38. Where do you see yourself as a Tarot reader in five years time? Consider how you'd like to feel about Tarot and about your skills as well as any outer achievements you have in mind. 39. Explore the cards which come to mind when you think of the word 'flow'. 40. Lay the entire deck in front of you in order. Sit in front of it and simply meditate on it for a while, looking at the various themes and figures. Then, write about whatever comes to mind. 41. Write about what's really inspiring you in the Tarot world at the moment - decks, readers, blogs, methods, spreads - anything goes. 42. If you woke up tomorrow and Tarot no longer existed, how would your life change? Write your ideas down. 43. Explore the cards which come to mind when you think of the word 'immaturity'. 45. Imagine that a querent is in a financial position to leave his job and start his own business, yet he is having doubts and problems with self-belief. Design a spread to help him. 46. Divide your deck into cards which feature mostly light/vivid colours and cards which feature mostly dark/muted colours. Write about what you notice as you look through the two groups. 47. What kinds of decks do you enjoy working with and why? What are your needs and expectations for a deck? How do you make decisions about which decks to buy? What are you looking for and why? 48. Read a post from one of your favourite Tarot blogs. Then write about your response to the post and anything which you would add or disagree with. 49. Explore the cards which come to mind when you think of the words, 'Own your choices'. 50. Write about a Tarot card which seems to convey your emotional response to the process of Tarot journalling.